Skulls And Kisses | UK Lifestyle and Alternative Fashion Blog. : Well I Guess This Is Growing Up. 1. One moment you're at uni and there's not really many rules and you can go out and drink as much as you want every weekend hell even weekdays if you want and no one thinks it's weird. Next thing you know uni is over and people reserve drinking for special occasions, like what is up with that? People prefer to sit in and have early nights than get together for drinks. No one prepared me for the shocked looks I'll get when I suggest Tequila I mean we're on a night out what else do you want? 3. So yeah on the topic of relationships and babies, you start to find babies cute. Like no one prepared me for this in the slightest, no one told me I'd want to hold someones baby or think they're cute or offer to take care of them. Like ew why am I wanting to do this, children just bring mess and like ew but they're so cute and playing games with kids is so much fun. And they say the silliest of things, but seriously is this something that happens what you hit a certain age? You start to think kids are great? 3. You start to like things that you used to think were gross, coffee? No issue I drink it every morning now, it used to be disgusting but now I can't believe I lived without it. Wine? Oh yes please I'll take more wine, is there just a switch in your head that just flips one day and suddenly you like eating/drinking adult things? I swear until last year wine was vile, now I'll drink any type and enjoy it..
4. Suddenly you start looking at people differently, well celebrities. You start fancying ones who are a little bit older and don't understand teenagers obsessions with floppy haired boys. Tonight while writing part of this post I was watching Labyrinth and I found David Bowie strangely seductive if that's not growing up I don't know what is. When I was younger Jareth was cool and all but didn't give me all sorts of weird feels ahaha. 5. Bands you love are either no longer together or aren't producing new music regularly, you have no idea who sings that song thats always on the radio or anything. It's like what do you mean 2006 was 10 years ago? What do you mean emo isn't really a thing anymore? I don't understand what you're trying to tell me. I guess this weekend I realised I'm pretty much an adult, and I'm kinda in denial about it. I mean I do enjoy the occasional quiet drink but I would love it if my friends would be game for tequila more often. I'm also super happy for all my friends who are taking massive steps in their lives but it scares me, I mean I'm sat here at home with my cat watching Kerrang while these other people my age are out there planning marriage and kids like I just don't feel old enough to know people doing that. 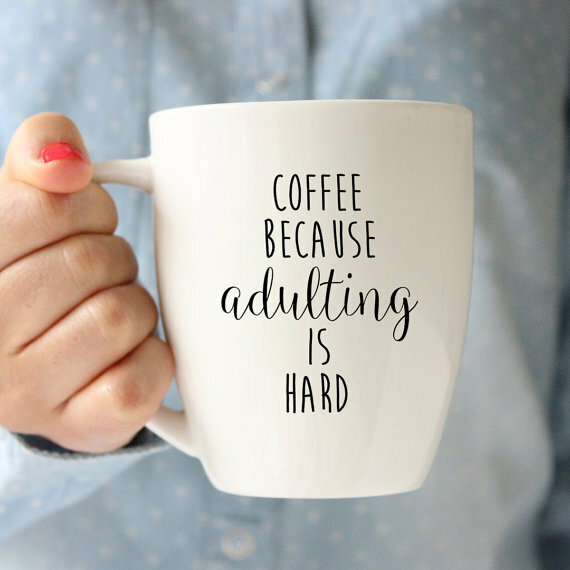 I do love that I've grown to enjoy coffee and wine though because both taste amazing and well I can deal with fancying old men. I guess growing up could be worse but what I want more than anything is for life to slow down a bit. Things seem to be getting far too serious and I'd very much like to rewind to school or maybe the start of uni. I miss everyone being so carefree although I do really enjoy living alone, setting my own bedtime and being able to eat cereal at 2am with no one to judge me for it. As Blink 182 Say, I guess this is growing up. I enjoyed this post a lot, Kloe. Growing up is such a complex process. I never understand how my thoughts and personal impressions can change so much, but they do. However, I try not to assume too many "adulthood conventions" as I don´t think you really need to. Aw I love this post <3 I've felt the same as you - particularly when most of the people I know have their own house and partners and I'm like I'VE JUST BOUGHT A NEW NINTENDO 3DS YAY!